Gaboxadol is a GABA agonist. Aminooxyacetic acid is a compound that inhibits 4-aminobutyrate aminotransferase (GABA-T) activity in vitro and in vivo, leading to less gamma-aminobutyric acid (GABA) being broken down. Fluxametamide is an insecticide with wide spectrum, acts as an antagonist of GABA- and glutamate-gated chloride channels, with IC50 of 1.95 nM and 225 nM for M. domestica GABACls and GluCls. Tofisopam is a 2, 3-benzodiazepine drug which is a benzodiazepine derivative. Estazolam is a benzodiazepine with anxiolytic, anticonvulsant, hypnotic, and muscle relaxant properties. 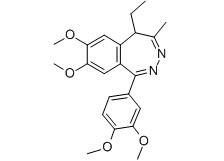 Estazolam binds to the gamma-aminobutyric acid (GABA) receptor at a site distinct from the inhibitory neurotransmitter GABA binding site in the limbic system of the central nervous system. Metomidate is an etomidate analogue. Afoxolaner is an isoxazoline that inhibits insect and acarine ligand-gated chloride channels, in particular those gated by the neurotransmitter gamma-aminobutyric acid (GABA), blocking pre and post synaptic transfer of chloride ions across cell membranes. Pikamilone is a drug formed by a synthetic combination of niacin and GABA. Metadoxine is a selective antagonist of the serotonin receptor subtype 5-HT2B and displays high affinity to the gamma-aminobutyric acid (GABA) transporter.